To celebrate the 90 year anniversary of the modern yo-yo, our friends at theYoYo Legacy Project are offering a gorgeous set of exotic wood yo-yos that represent the historical milestones of our favorite toy. No dyes, stains, or tints are used; you’re seeing the natural color of sustainable, exotic woods from all over the world. While designed to be a beautiful desktop display piece, all yo-yos are fully functional. The Kickstarter will be running until July 9th, 2018. In 1928 Pedro Flores, a Filipino immigrant, worked as a bellboy in a downtown Santa Barbara hotel. In his spare time, he hand-carved a small disc toy he called the Yo-Yo. On his breaks he would go out to the sidewalk and show passersby his toy and the unique tricks that could be learned. It captivated those who saw it! Americans loved the simple toy and Pedro Flores did not remain a bellboy for long. On June 9th, 1928, Flores set up the first American Yo-Yo manufacturing operation in the Granada Building in downtown, Santa Barbara, California. Within two years he was producing 300,000 Yo-Yos a day at a cost of 15 cents to $1.50 each and promoting the first ever Yo-Yo contests throughout the area. This project is a celebration of Pedro Flores and the 90th Anniversary of the Yo-Yo in America. It is also a tribute to my childhood love of the Yo-Yo and my lifelong passion for beautiful wood. How better to celebrate the 90th Anniversary of this wonderful toy than to create functional, desktop art with five historically significant Yo-Yos turned out of exquisite, exotic woods. Backers have the option of quite a few cool rewards, including a reprint of the 1928 Flores trick booklet, a full set of the yoyos with a desk stand, and even a trip to their workshop to learn how to make wooden yoyos yourself! Check out the full Legacy YoYo Project on Kickstarter and pledge your support today…the Kickstarter campaign ends July 9th! And be sure to follow the YoYo Legacy Project on Instagram, Facebook, and Twitter for updates. We get a new edition of everyone’s favorite fixed axle yoyo, we get a new video of fixie impossibilities from Ed Haponik, and we get the smug satisfaction that comes with feeling vaguely superior to all the people who don’t play fixed axle. Ok, that last bit only lasts for about 6 minutes and it’s not our most endearing trait, but hey, it’s the holidays, and we want a little validation for our hard work, ok? Our knuckles are a mess. YoYoExpert.com will be releasing the 2016 edition of the SPYY x TMBR x YoYoExpert eh at 8 pm EST on Monday, Dec. 19. This edition comes in FOUR different exotic woods, making it the most diverse and beautiful edition yet! The eh will be available in Wenge, Bubinga, Zebrano, and just TWO pieces made in Ebony wood. These will retail for $85 each, and the Ebony version will retail for $200 each and only be available to purchase via raffle. 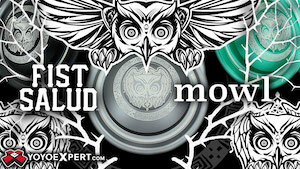 More details up at YoYoExpert.com! Former World Champion Jensen Kimmitt just dropped a really damn good fixed axle video, with one of his own handmade yoyos. Interesting tricks done well with style to spare…hard to get much better than that, right? Once upon a time, all yoyos were fixed axle. Therefore, all yoyo tricks were fixed axle yoyo tricks. That’s just how it was. Then some dude in Sweden threw a ball-bearing into a yoyo, and some dude in San Francisco threw a ball-bearing into a good yoyo, and then all hell broke loose. Now we’ve come to the point where fixed axle yoyo play is a rarity, not the norm. Modern tricks don’t work well on fixed axles. But a handful of people have decided that there just need to be more modern tricks that do work on fixed axle yoyos, and thus we have Ed Haponik. For a while, the vogue was to try and hit really hard modern tricks on fixed axle yoyos just to prove you could. It was vain and ridiculous and fun, but all it proved was that fixed axles were largely obsolete equipment. What players like Ed Haponik and Drew Tetz and a few others have done is embraced the limitations of fixed axle yoyos and simply created modern tricks that are intended for them, instead of done in spite of them. The modern fixed axle renaissance is fantastic, and watching players like Ed find ways to make fixed axle play not only difficult but native is truly exciting. Watch this video and enjoy. And then go get one of these or one of these and get to work.